Have you ever been told Chocolate is good for your skin? I always use to hear it caused breakouts but in-fact it helps your skin, okay well dark chocolate. Flavonoids found in dark chocolate protects skin from the sun's UV rays but don't go skipping on your sunscreen. So on that retrospect it makes sense that the world has the first beauty functional dark chocolate that's spent 10 years being researched & approved by Cambridge Chocolate Technology scientist. Esthechoc. Improvement of oxygen saturation of skin by 87%! 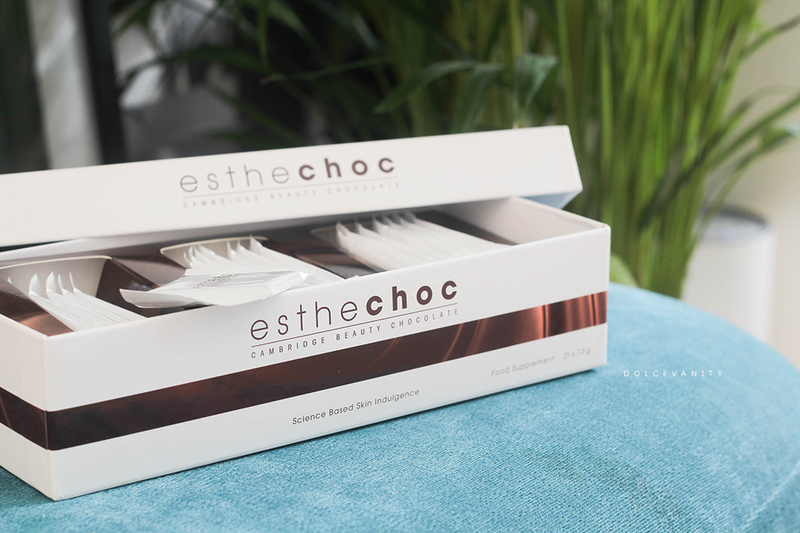 Esthechoc bars are vegan, diabetic-friendly and suitable for all skin types. I think I need more...I noticed breakouts were actually reduced during my menstrual cycle as those are the times I tend to get spots. So I decided to begin this after my last cycle until the next one and as my cycle is like clockwork (ok it was at the time of this trial). Menstrual spots happen not just on my face, sometimes I might get a few on my chest or back and those didn't appear. 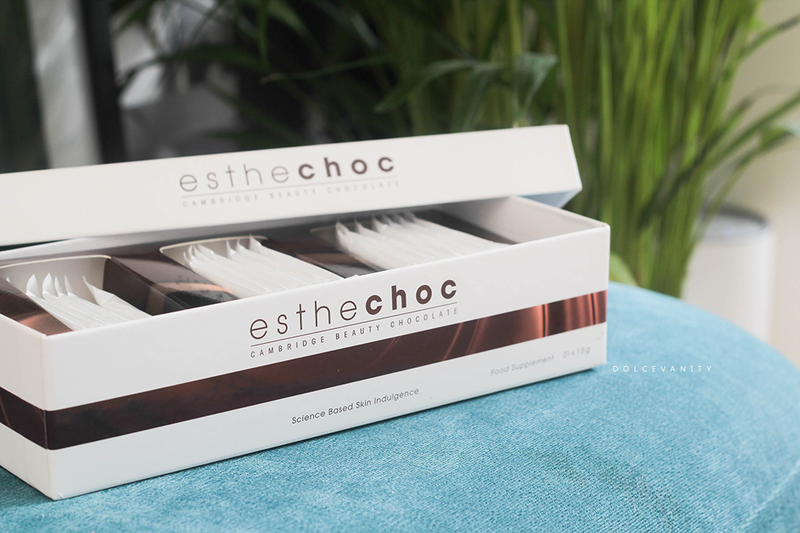 I'm never normally a fan of dark chocolate but to be honest, one small square a day was nothing compared to the benefits I was getting from Esthechoc. I think it's quite revolutionary, sometimes I wonder is it a placebo effect but I don't think it is. My skin was improving a lot to the point I was more confident to wear light coverage foundation (look here serum foundation only). It was an encouraging reminder to myself that it's not just topical skincare but what goes into the body that helps our skin as well as genetics - unfortunately as I'm getting older I can't be as carefree as I was 10 years ago regarding my skincare. What do we think? Is Esthechoc something you'd consider for better skin? Oh wow!! Now I definitely think this is something I'd love to try!! It's so true to remember that its just just what we 'apply' to our skin, that affects our skin! I'd love to try it. It sounds like it worked really well for you! Yes it did, I wouldn't be opposed to trying it again. Oh wow. Chocolate that is good for you! I'd love to try this out. Like you when I'm on my menstrual cycle my skin is at it's worst. I don't like dark chocolate but I might make an exception for these! Yeah I don't favour dark chocolate but one square a day for a positive benefit is minor in my case. I really like dark chocolate so would definitely consider trying this! Oh you may end up doing the entire box haha! Skin care & chocolate? SOLD. It sounds fantastic! Haha I know right?! Good for chocoholics. This is really interesting. I didn't know you could put chocolate in skincare products but it makes sense as they have antioxidants in chocolate. Well these are little chocolate squares that are taken daily in conjunction with your skincare - pretty interesting.